Rabbits, like dogs and cats, are prone to obesity. Rabbits that are obese are not able to function normally because of their large size and body fat percentage. 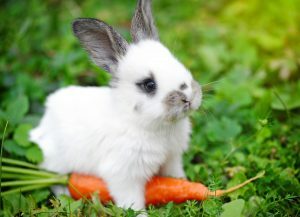 Although certain breeds of rabbit, including the dwarf rabbit, are more at risk for obesity because of their shorter stature and inactivity, obesity occurs most often among middle-aged rabbits that are caged. This applies to both male and female bunnies. Typically rabbits prone to obesity tend to be more than 20 to 40 percent overweight. An easy way to determine this is to give your rabbit a physical exam. If you can’t find his or her ribs under the layer of fat and skin, then it is probably obese. Other signs of obesity could include flaky dermatitis, as the rabbit has difficulty fully cleaning under its skin folds. He or she may also have difficulty breathing and be excessively tired. Being caged too often and too long is one of the primary causes. Also being fed too much. If your rabbit is fed too many treats or snacks during the day and not allowed to exercise, then it is sure to become obese. If you’ve done that basic body exam and you think your bunny’s too fat, take him/her to the vet because you could be wrong! Before diagnosing obesity your vet will want to rule out conditions like pregnancy, a tumour mass or other abdominal and intestinal masses; fluid in the abdominal cavity can also mimic obesity. Other tests include those which measure the rabbit’s body fat. How do we fix our fat bunnies? Proper nutrition is key. Feed your rabbit high-quality grass hay and fresh greens, including lettuce, parsley and carrot tops in addition to his/her pellet diet. Fresh fruits and other non-leafy vegetables are not recommended if your bunny is fat, as these can lead to other health problems. Ask your vet for help in drawing up a suitable diet for your rabbit. Your vet will assist in establishing long-term, reachable weight loss goals. Ensure your rabbit has plenty of time and space for exercise every day. This is key to managing weightless and long-term health. It is also important for your rabbit’s overall wellness that its caged area is kept free from dirt and faeces. Clipping excess hair and brushing matted hair will also help keep the rabbit clean.